Another blogger, A Whimsical Bohemian, started a world-wide event called “One World One Heart.” It’s an interesting concept – to connect people who blog to one another. It’s a way to connect with others throughout the world…especially with those you may not have otherwise have met unless they were a part of this event. But more than that, you can get a glimpse into the world of almost 800 people. Perhaps you’ll learn something new. See something inspiring. Do something different. Who knows. It’s up to you to discover what’s out there. Leave a comment below now…and make sure to include your email or a way for me to track back easily to let you know if you won. I love it! Please enter my name in your drawing. This is very pretty! Thanks for including me in your drawing! I can just imagine the sun coming through that beautiful star, hanging in MY window. so pretty!! i want to win! Great Fun and so colorful . Hi from the Netherlands.Love your blog and giveaway!Come fly with me to my OWOH blog (#7) at Loose Ends and take a chance on winning my giveaway too! I have never seen anything like this – it must look gorgeous with the sun coming through it!I would love to live with this!Thanks for entering my name in your drawing – please visit my blog and enter mine! What a beautiful origami star. Yes please enter me and stop by my blog too and enter. My number on the list is 796. Thanks. I love this concept and was just reading about it from another friend's blog! Please count me in! I'd love to win your lovely star! on January 29, 2010 at 8:40 pm | Reply Julie G.
Wow! You made it? Cool! Please include my name! I applaud you for homeschooling!!! Wish it had been an option when my boys were young.I love your star..haven't seen anything like it and it would sure help on these foggy, gloomy days.Please visit me at http://pawsn2stamp.blogspot.com. I am #515 on the carpet ride!! on January 29, 2010 at 11:03 pm | Reply Mary Isabella and Kiley too! So pretty. Please add me…m. Checked out your ETSy shop, wow that's a lot of folding! I love your work. I saw this show on PBS that I think yo might like it was called Between the Folds. http://www.pbs.org/independentlens/between-the-folds/match-the-folds.html It's all about folding paper and is AMAZING!! I've been following you on Flickr for a long time but just found your blog. Very nice. PErfect for my patio. I'm #736 so please visit. Great giveaway- saw you in the trade-a-holics forum… I too am hosting a OWOH giveaway: #783, C'mon by! Your sun catchers are beautiful! I just love these! Please count me in. Nice to meet you! Your origami star is adorable. So colorful. My OWOH giveaway is #79 on the magic carpet ride. I always love your stars! They always look so pretty and delicate! So pretty! It would look lovely hanging in my studio window.I'm #390 on the carpet ride. Oooh, I've never thought of looking at origami up to the light, genius!! What a beautiful and unique giveaway ! Thanks for including me in the drawing. I hope you have a wonderful OWOH adventure ! Really nice giveaway!Please enter me in the draw and don’t forget to enter mine. Thanks for flying by to visit my blog. Your origami is beautiful, please put my name in your draw. what a great giveaway.very pretty. thanks so much for the opportunity to enter the drawing. so delighted to meet you through this event. I hope you'll stop by my blog as well. Oh that's beautiful! Please enter me! 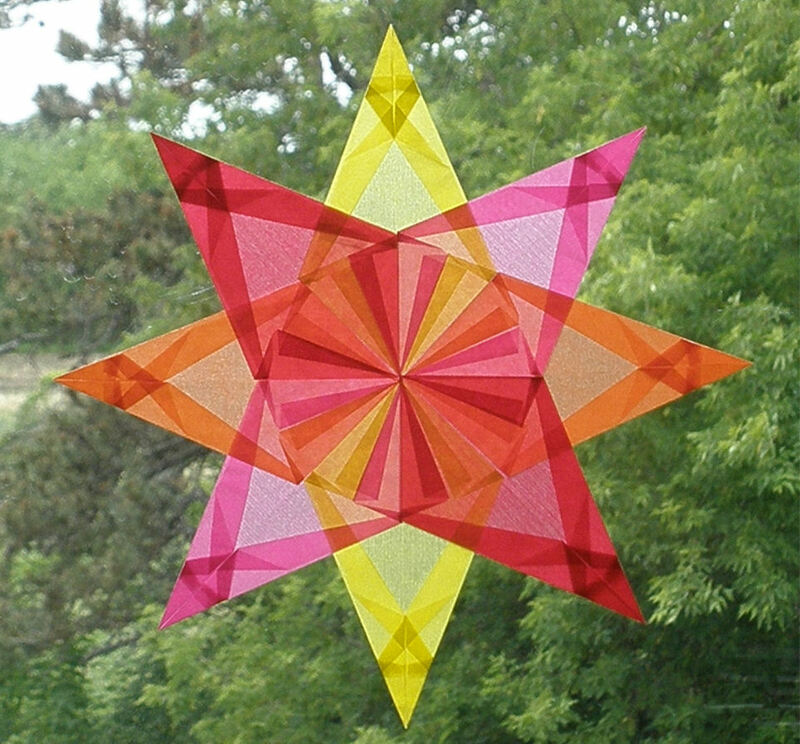 Greetings & Salutations, Enchanting Origami Window Star OWOH Giveaway!Really Pretty.Fly by my blog when you get a chance…Forbidden Planet Giveaway #242 On The List @:http://todaysgold.comLovely Blog.Cosmic Blessings, Lyndy WardP.S. I will be announcing three winners on 2/15/10. AND if I'm lucky enough to win any treasure, that booty will be displayed as well. AND the OWOH Giveaway win(s) will remain on my blog in Awards & Contests for eternity. This is gorgeous! Thank you for sharing with us. on February 7, 2010 at 8:16 am | Reply S.
That star would really add some cheer to the winter, please count me in.When you get a chance, please fly by my blog on your magic carpet, I am OWOH #907.Thank you for participating in OWOH.It is so very very nice to meet you. I love the colors! Light, bright & cheery! Come see tatted lace at #753. Love the colorful window star. How pretty. I love the colors. I would also like to know how you made it. I'm off to take a longer look at your blog! I would be honored to win. Please enter me in the drawing isastephanie @ yahoo dot comcome by and enter my giveaway:luluscottage.blogspot.comHave a great day! Hi from a blogging Waldorf Teacher! I recognize the style:o)What a great giveaway, please count me in!If you have time and have not yet done so, please come and visit mine (154 on the magic carpet).Greetings from bonny Scotland and enjoy the ride! on February 9, 2010 at 1:58 pm | Reply Heather! What a beautiful star! I have the perfect window all picked out for it!So nice to meet you on this magic carpet ride. Please stop by my blog and meet Barney the Gnome. I adore your star. Thanks for giving. Great giveaway! Please count me in.Come to enter my giveaway if you haven't already (i'm #481) =DLet's continue the ride on the magic carpet! The window star is just beautiful! Please add my name to your drawing. And be sure to stop by #389 for my giveaway. I love this!! It would be great in my kitchen! Love the colors!! Hi from Ireland. What a lovely give-away you have here. Thanks. Hi from a fellow homeschooler in England! I'd love to be included in your giveaway, thank you.If you haven't already, please visit my blog at #711 on the magic carpet to win a designer Cath Kidston bag, handmade by me! How lovely. I'll have to go poke around your etsy shop and see what else you're creating.My OWOH giveaway is for one of my fine art photographs – stop by and see what strikes your fancy. on February 15, 2010 at 4:19 am | Reply - Marybeth I.
on February 15, 2010 at 5:36 am | Reply Lisa W.
Thanks for the giveaway.Hello from Coronado!